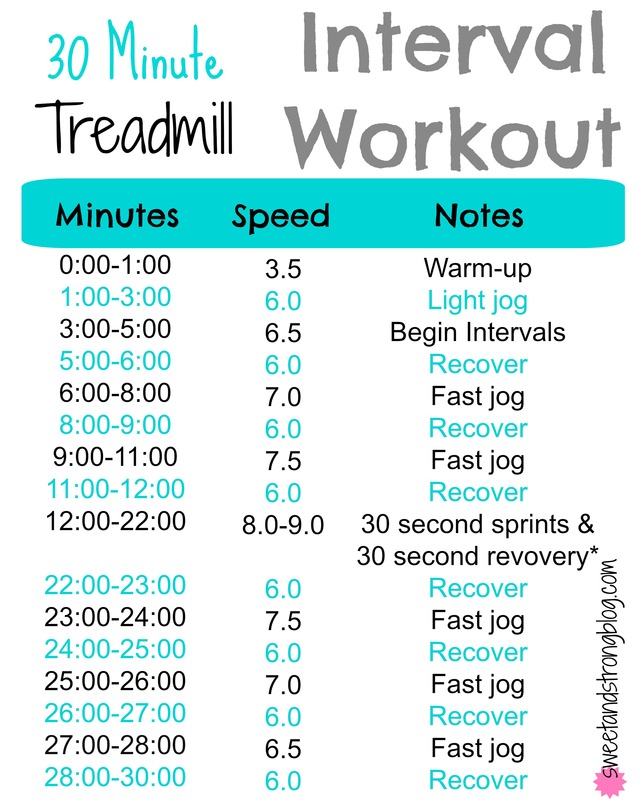 This Sprint Training Treadmill Workout is 30 minutes of high intensity interval training. The time will fly by with sprint and recovery intervals for a great indoor cardio session. Running has always been my favorite type of cardio. In college I was totally guilty of setting the treadmill at 6.0 and people watching for 30-40 minutes straight. While at least I was doing some type of cardio, on a treadmill you really want to be completing speed intervals or increase the incline in order to get a quality workout. A few years ago I started playing around with the speed and incline on the treadmill to create my own workouts. I nocited not only did the time go by faster, but I pushed myself way more when I had a workout plan wirtten down. Here is my absolute favorite treadmill interval workout to complete because I slowly speed up to the sprints with recovery in between and then come back down to a jog to cool down. This workout is probably more intermediate, so if you are new to running or using a treadmill you might want to subtract 5-10 from each of my speeds. Generally I consider a recovery speed on a treadmill from 3.0 – 4.5 walking, a light jog anywhere from 4.5 – 6.5, a fast jog from 6.5 – 8.5 and a sprint from 8.5 – 10.5, but adjust accordinly. And you could also up the incline 1-3 for a more intense workout. You don’t have to do the sprints at different speeds, just a suggestion. If you give this workout a try be sure to tag me on Instagram @sweetandstrongblog and use the hashtag #sweetandstrong. And eat these Oatmeal Raisin Energy Bites as a great post workout snack. Linking up with Annmarie for Wild Workout Wednesday. And check out great Gym or At Home Workouts on my Fitness Page. Do you prefer running on the treadmill or outdoors? Tell me about a new workout you tried lately. so excited to see your blog up and running! love reading a little about your life every day! also, this workout would kill me 🙂 hope to attempt something like it soon! I did sprints this morning! I love workouts like this. They’re a great way to break up a run that might normally be boring! Totally agree Jessica! Sounds like it was a great workout. Have a great Wednesday! I need to mix them up or I get way to bored. Hope you’ll give it a try! I prefer running outdoors but sometimes I will run on a treadmill. I usually set the incline at 1 and will watch Netflix to get through the workout without staring at a wall. This seems like a great workout to try next time I’m on a treadmill! I’ve been trying to use the incline more an more, it definitely makes it a more challenging workout! And I’m with you, I always watch the TVs at the gym, I can’t just stare at a wall. I don’t mind running on the treadmill especially when the conditions outside are not ideal. I do get a but bored so when I vary the incline or pace it makes the time go quicker. Same Lacey. I like running outside, but if it’s dark or the weather doesn’t allow it, I’m fine with mixing with the incline and speeds for a treadmill workout. Hope you’ll give this one a try. What a great workout! I think the treadmill is a great way to get in some speed training, especially if you are struggling to pick up the paces outside. I prefer to run outside but still love my mill is the weather is bad at all or I don’t have time to get to the park! Yes I agree Julie. Nothing beats an outdoor run, but when they can’t happen I’m perfectly happy with the treadmill. Totally agree Kayla! I feel so good after an interval workout! Hope you’re having a great week. This looks awesome – thanks for sharing. I am always looking for treadmill workouts to make things exciting. I just did a fun, 46-minute one last night! Dang nice! Sounds like it was a great workout. And I agree always looking for different ways to make the treadmill more exciting. I love me a good sprint workout! They’re the best right! Hope you’ll give this one a try. Thanks for sharing this workout! I’m bookmarking it for a day I’m stuck inside on the treadmill. Switching up the speed helps make the workout go so much faster! Hi Erinn! I totally agree, playing with the speeds makes the time go by so fast! And it’s easy to push yourself to if you know you only have to sprint for say 30 seconds then you get to go slower. Yessss. Love treadmill interval workouts! Pinned for later! Some days I really look forward to a good treadmill workout! Hope you’ll give this one a try. The only way I can run on a treadmill is with some kind of workout. Love interval workouts! I totally agree Sarah! I can’t believe I used to just run at 6.0 for a long period of time. What was I thinking! They’re not only so good for you, but the time goes by much faster! Hope you’ll give this one a try. Maybe I’ll give this a try (on a rainy day LOL). I am not a fan of the ‘mill, but I can tolerate it for an interval workout such as this. Great way to mix up the routine! I totally understand not being a fan of the treadmill. But definitley save this one for a rainy day and give it a try.